Inspirational Ribbon Plates are a great way to add Scripture and Inspiration to any room or workspace. Adorable ceramic plates with just the right sentiment to uplift, cheer and inspire! 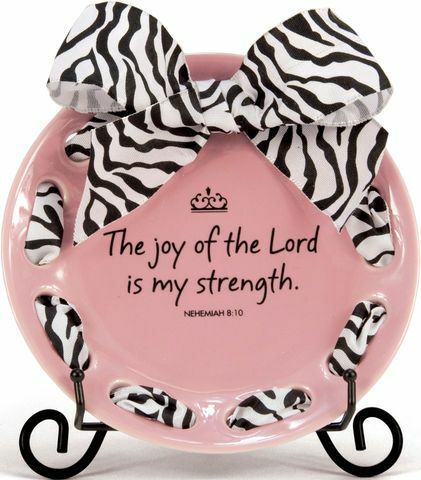 This Inspirational Ribbon Plate features the scripture "The joy of the Lord is my strength" Nehemiah 8:10. Inspirational Ribbon Plates are made of ceramic and are 6 inches in diameter. The metal stand is included. Grosgrain ribbon has been threaded through holes in the outer edges of the plate. Inspirational Ribbon Plates make great gifts for any occasion.